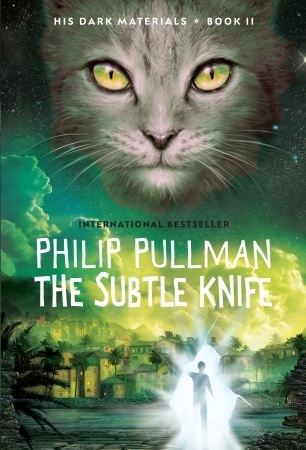 The Subtle Knife is the second book in the His Dark Materials trilogy by Philip Pullman. If you haven’t already, check out my review of The Golden Compass. The book starts off by introducing us to a new character, Will Parry. He’s a 12-year-old boy living alone with his half-crazy mother. But sketchy men keep pestering his mother, which eventually leads to him accidentally killing one of them while trying to protect his home from these intruders. He hands his mom off to a close friend for care and goes off on his own, ducking from the police and the suspicious men. 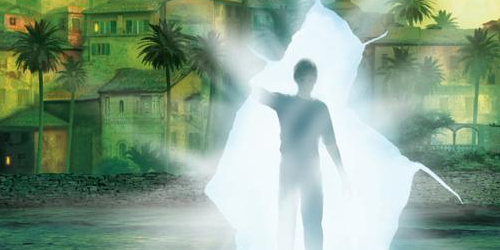 Suddenly, Will comes across a semi-invisible window in the air. This window leads to another world, Cittàgazze. Will uses this other world to escape the authorities and begins to explore. This new world appears to be completely abandoned, but it’s where he eventually meets Lyra Belacqua. 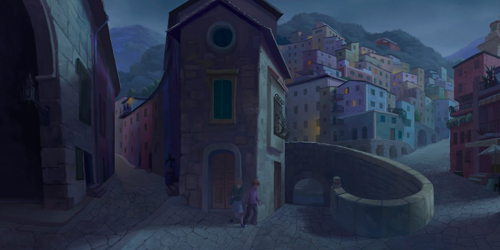 The two explore the unique town and decide to embark on separate missions: Lyra wishes to enter Will’s world to gather more information about Dust, and Will wants to learn about his father (an explorer who went missing). So the two head back through the window into Will’s world. Lyra uses the alethiometer to locate a “Dark Matter” scientist named Dr. Malone. Dr. Malone has discovered a way to communicate with Dust, much like how Lyra uses her alethiometer. She also meets a suspicious — but wealthy and noted — old man by the name of Sir Charles Latrom. Sir Charles steals her alethiometer and says that in order to get it back, she must bring him a knife from Cittàgazze. Will and Lyra return to Cittàgazze together to retrive the knife. Will has to overpower a man named Tullio but eventually wins over the knife, losing his two fingers in the process, thus marking him as the new bearer of The Subtle Knife. Will learns that this knife can cut through any object and can also make windows into other worlds — exactly like the one he first came through. Rather than giving the knife over to Sir Charles, they use it to cut windows into his home and steal back the alethiometer. But in the process, we learn that Mrs. Coulter has returned and is meeting with Sir Charles. 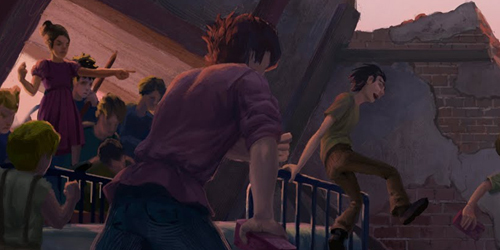 When they finally return to Cittàgazze, they are hunted down by the children of that world for supposedly being responsible for Tullio’s “death.” Luckily, they’re rescued by Witches at the last minute. The Witches partner up with Will and Lyra, using the alethiometer to guide them to Will’s father, who is being brought to Will by Lee Scoresby. 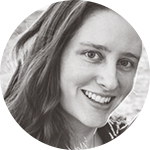 What makes The Subtle Knife so interesting is that it takes all the differences between Lyra’s world and our world and makes them more obvious. In The Golden Compass we just have to examine Lyra’s world and think about the differences on our own. But in The Sutble Knife we get introduced to other parallel universes, one of them being our own world. When Lyra meets Will she learns about and experiences our world for the first time. She sees the strangeness of it and we’re able to better compare our world to hers. When she first meets Will she’s horrified that he doesn’t have a daemon. But then she decides that he does have one, it’s just inside his body. This second book spends more time focusing on the characters and their own stories and developments rather than the overarching plot. Of course the plot does exist (and it’s great! ), but I find that a lot more happens action/plot-wise in The Golden Compass than in this sequel. 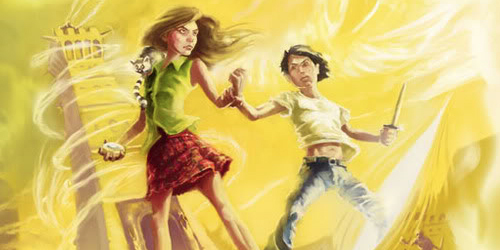 Philip Pullman spends a lot of time introducing us to Will and developing Lyra’s personality. Lyra was always so sure of herself in her own world but now that she’s exploring others, she’s overcome with uncertainty. She feels like she doesn’t fully understand these other worlds and she gets tricked and ‘beaten’ a lot more often. We also see her change in other ways. Lyra begins to limit her use of the alethiometer, using it only to help Will. She forms a very close relationship with him and respects his privacy. As for Will Parry, he’s an excellent character! On the one hand, he’s incredibly mature and grown up for his age. He’s only 12 but he’s had to take care of his mother and look after her for years. That has definitely made him pass through his childhood years much more quickly. But on the other hand, he’s not this perfect, strong, grown up boy. He doesn’t want to be grown up. He knows he’s only a 12-year-old boy and he doesn’t want to have to be playing the part of the parent. He loves his mother dearly but all he wants it for his father to show up, tell him what a wonderful job he did, and take over so that Will can just play the role of the child. 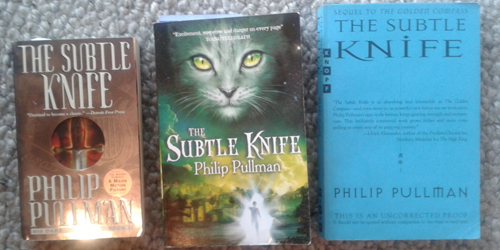 Featured: 3/4 of my editions of The Subtle Knife, including an uncorrected proof. Missing is the first UK edition. The book introduces excellent new and interesting characters, plots, and twist. There’s even one incredibly heart-wrenching scene that had me tearing up the first time I read it. It’s a worthy sequel to The Golden Compass and a wonderful introduction to the third book, The Amber Spyglass (which is probably my favourite.. but more on that soon ;)).